Here at the moving center, you'll will find all the stuff you need for your big move. Hook up and save on your utilities. Find self storage units in your area, moving truck and trailer rental centers, moving companies, and where to buy moving boxes. Moving? Connect your utilities within a matter of minutes! Save up to 30% on cable, satellite, internet and phone! 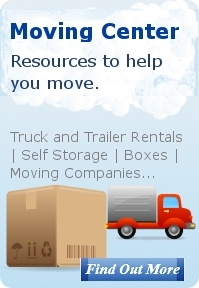 Find Trucks, Trailers, Boxes and Storage at U Haul. Our Moving Center is a work in progress. This page will be updated often. Is there a site you think should be included here? Send us an email and let us know.